Parents are getting used to the idea that there are certain foods they should encourage their kids to eat and others that they should avoid. Of course, kids should also avoid a lot of high-fat foods and high-calorie foods. Kids do need some fat in their diet, but in general, only about 30% of a child's daily calories should come from fat—most of which should be unsaturated fat. Food labels and the % Daily Value are based on the nutritional needs of adults, so that the absolute number of fat grams that the average adult requires each day, which is about 65g, is more than that for a five-year-old who only needs about 1400 calories and 45g of fat each day. You can still use the food label and % Daily Value for fat as a guide when choosing low-fat foods for your kids. Parents are often told to choose low-fat foods, but it may be easier to avoid some of the popular high-fat foods that your kids are likely already eating. A good next step would be to learn how to recognize foods that are high or low in fat. Read food labels and begin to choose those foods that are lower in fat. In general, a food that is high in total fat will have 13g or 20% Daily Value (or daily requirements) of fat per serving or more. On the other hand, a low-fat food will usually have about 3g or 5% Daily Value of fat per serving or less. Beef, pork, lamb, turkey, and chicken can also have a lot of fat, although that can be reduced if you trim off visible fat before preparing and serving them. Also, instead of serving them fried or with extra breading—which will increase the fat content of the meal—serve them broiled, grilled, boiled, or roasted. Buy the leanest beef cuts (which will have the least amount of fat), including round steaks and roasts (round eye, top round, bottom round, round tip), top loin, top sirloin, chuck shoulder and arm roasts. Cook the leanest pork choices, including pork loin, pork tenderloin, center loin, and ham. Choose ground beef that is at least 90% lean. Either buy skinless chicken parts or remove the skin before cooking and serving. Give your kids lean turkey, roast beef, ham, or other low-fat luncheon meats, keeping in mind that regular bologna and salami can have more fat. Of course, the amount of fat and calories your kids consume when they sit down to fast food is going to depend on the serving sizes they are eating. For example, a 12 oz Vanilla Triple Thick Shake at McDonald's has 10g of fat (15% Daily Value*) and 420 calories. On the other hand, a 32 oz version has 26g of fat (41% Daily Value) and 1110 calories, which is almost half the fat and two-thirds of the calories that most older children need all day long. Similarly, a small order of french fries at McDonald's has 13g of fat (20% Daily Value) and 250 calories. If you upsize that to a large order, you will increase the fat to 30g (47% Daily Value) and calories to 570. It's clear from the above examples that a child could get almost all of the fat she needs for the day (and then some) just from a large order of french fries and a large shake. That makes it important to read the fast food nutrition facts at your favorite fast food restaurants and learn to choose low-fat foods, even if you're out to eat. Limiting fast food all together can also be a good idea to help limit your child's intake of high-fat foods. *Daily Values are based on the needs of adults. Dietary Recommendations for Healthy Children, American Heart Association. Updated May 14, 2015. McDonald's USA Nutrition Facts for Popular Menu Items. USDA. Inside the Food Pyramid. 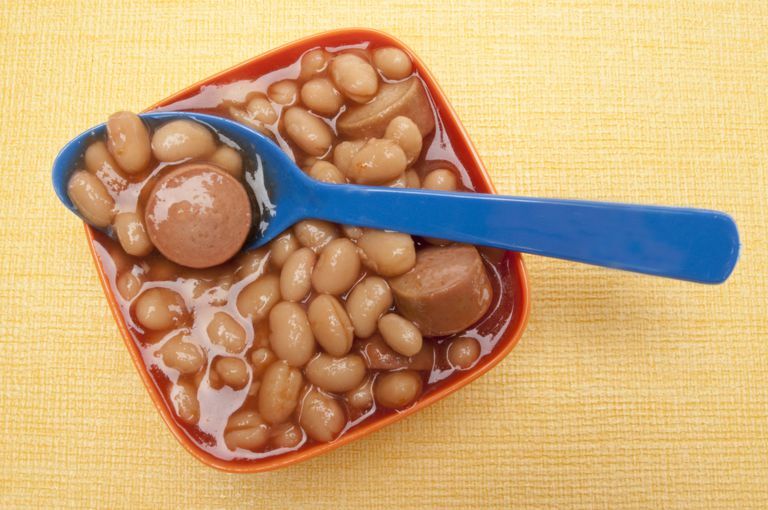 Tips to help you make wise choices from the meat & beans group. USDA National Nutrient Database for Standard Reference, Release 18. Total lipid (fat) (g) Content of Selected Foods per Common Measure, sorted by nutrient content.